If you are not a current member of Dark Wolves, but you wish to apply to join us, we ask that you read our rules and the brief "About Us" page then fill in the Application Form on this website. Clicking on this link will open the Application Form in a new window, so that you can refer back to these instructions for help at any time. Once you have filled in and submitted the application form, a copy of your application will be placed in our forums, at which point you will be able to view and add to that forum thread. Ideally, if there are any questions we wish to ask, we will ask them there and would hope for a response. We will also change the status of the forum post once we have made a decision as to whether your application has been approved or declined. We will not accept anyone who has not read and understood our guild rules .. if you have any questions about them, please ask. We are an 18+ guild .. meaning we only accept those under the age of 18 in exceptional circumstances. Please ensure, when filling in your character details, that you select the realm your character is on (Lightbringer or Mazrigos) .. it may not necessarily default to the correct realm. The application form is there for you to sell yourself ... you get plus points just for simply bothering to get to this stage in the process, but then submitting a minimal application lets you down at the final hurdle. Please be honest on your application form. We can check information given, and if you give incorrect information you run the risk of being rejected. Please note that there is information in both the guild rules and About us pages relating to how our guild works and interacts. Please do not apply to join us if that information runs counter to the type of guild you want to join. If you're unsure, you're welcome to ask questions prior to applying via any of the means highlighted on our "Contact Us" page. If you are applying with a character that is very low level, please bear in mind we may be unable to view this on the Armories. We will therefore either ask for a character name/realm of a higher level character so that we can check information given, or we will wait until the character you've applied with shows on the Armories. If neither is forthcoming within a reasonable length of time following submission of your application, it will be rejected/closed. If you are already a guild member and simply wish to register with this website, go to the instructions for the Launch Code. The Application process is in two parts. The first part is registering with the website hosting service - you cannot apply to the guild (or any guild using Guildlaunch for their website host) until you have a valid account with them. The second part is the actual application to the guild. If you already have a Guildlaunch username and password (for example you have applied to or been a member of another guild who uses Guildlaunch), then simply fill in your login details in Pic. 1. 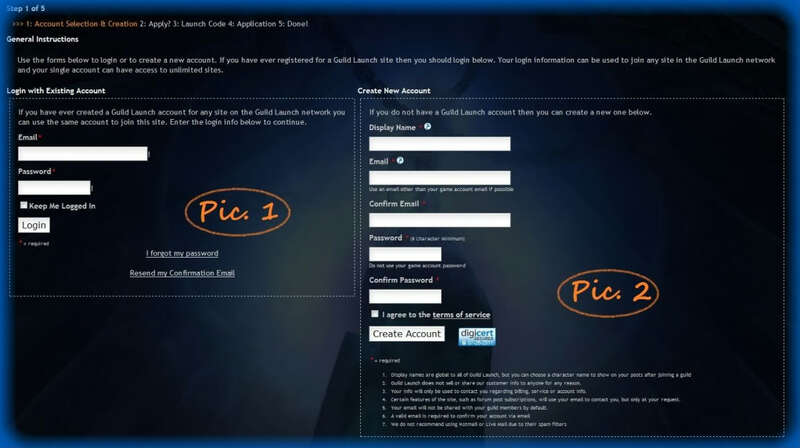 If you do NOT have a Guildlaunch account, you will need to create one by filling in the details in Pic 2. Please note that your username will be shown around the various sites, so ideally it should be something you are comfortable showing it on forums, etc. The username must also be unique throughout the whole of the Guildlaunch site, which means there is a possibility someone else on another guild may already be using your chosen username. If you can, we recommend your username reflect your main character name, but of course this is not always possible. In order to complete the Guildlaunch registration you will be sent a verification email to your registered email address - please ensure you use a valid email address. Please note that the "Confirmation Code" included within this verification email is NOT the launch code and is simply to verify that you are the owner of the registered email address. At this point we shall assume that you are wanting to apply to join Dark Wolves and get full (member level) access to our website. Therefore choose the top option as shown above, and click "Continue". 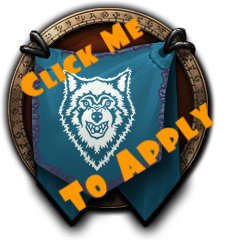 If you are not currently a member of Dark Wolves, and wish to apply to become one, please click the button shown in Pic. 4 ("Skip Launch Code and Continue"). You will now see the Guild Application form. Please fill it in honestly and to the best of your abilities. There is a free text box near the end to add any further comments if you wish, and you can also add further information in the application forum thread, once it has been created. 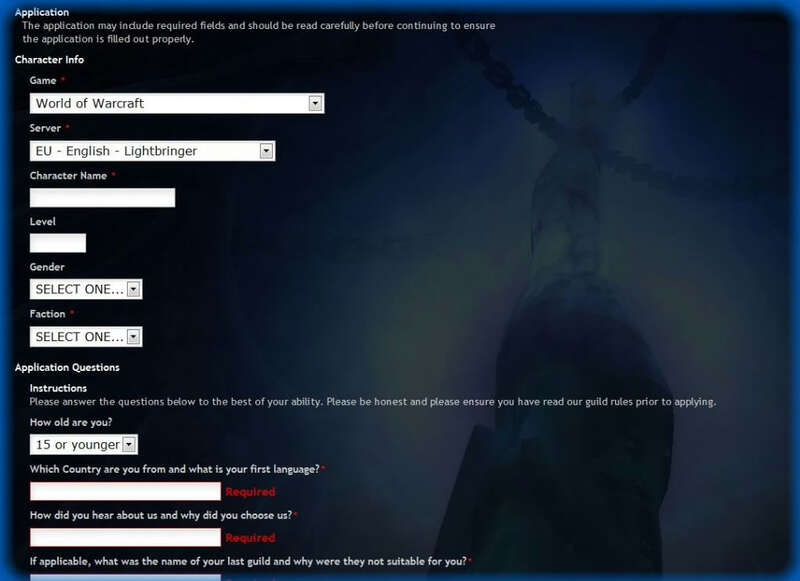 Please ensure that you pick the server your character is on .. if you pick Lightbringer but your character is on Mazrigos, for example, it will generate an invalid or incorrect link and may cause your application to be rejected. We recommend that you choose to be sent an email when your application is either approved or declined, so click the "Yes" option, then simply press the "Submit Guild Application" button. Your application will now be logged on our website for us to view and discuss. Once we have made a decision, an automated email will be sent to your registered email address (assuming you have chosen to receive notification) and the forum post will be changed to either "Approved" or "Declined". If your application has been approved, we shall try to make contact in-game with you, however, if you are not contacted please /whisper one of the members online, referring to your website application. Thank you for taking the time to look through our website, read this guide and filling in your application form. Regardless of the outcome, we wish you well in the future and welcome any comments you may have about the application form, process or website.